Lil Mike had a special relationship with Grandpa James as you know. She loved all her grandmas and grandpas, aunts, uncles and cousins one, two and three times removed. She loved JT and Joe her uncles unremoved. And, she loved her mother Marie very much indeed. Marie was the owner and manager of an accessories boutique in town. It takes time to start and keep up a business, so Marie is gone much of the time. Marie has breakfast with the family in the morning and then she is off to work. She rarely makes it home for supper but she is always there for goodnight kisses and secrets before sleep. Six days a week Marie goes to town but on Sunday the boutique is closed and Marie and Lil Mike enjoy "Girls Day." Right after church the two of them head off to one of their favorite places, or, they go find something new. But, whatever it is, or wherever it is, it always causes quite a stir for Belle. How in heavens name can a mouse keep track of everyone, when everyone keeps running hither and yon all at the same time? The biggest problem with the girls' adventures is that far too often Buddy, Snow, Wink or Pal were not invited (which is just plain rude). So Belle would spend all week giving assignments and preparing for Sunday trips so that she could go along unnoticed. Being unnoticed when you are a flying mouse was much easier when Belle first came to our world. But now it was very difficult. Why, she had so many anxious and even terrifying close calls in the last few years that she had had to go home and put her feet up with hot cocoa and a cuddly blanket to calm herself down. Marie and Lil Mike enjoyed the library, the carousel in the park, Bigsby's conservatory full of flowers, and the movies. They liked to go to Renaissance faires in the summer and Christmas bazaars in the late fall. But, the most difficult outings for Belle were their special days at the beach. If it weren't for the fact that Pal and Buddy were allowed to come Belle was sure she would collapse completely. *Do you have any idea how many things are flying around at the beach trying to knock little mice about the sky? Do you have any idea how hard it is to fly safely in the gusty beach wind? Once everyone is tucked and buckled they're off. Belle tucked way down under sometimes gets a little seasick before she sees the sea. So it takes her awhile to get her sea wings over her (if you know what I mean). Lil Mike loves the ocean, the sand, the wind. There is always a list of things they must do. Buy salt-water taffy at "Tommy Taffys"
The day's activities are organized based on the wind and the tides and this day was no exception. This was the first trip of the season. It was still spring but the weather was lovely and the beach was beautiful. There was a new addition to the beach this year. It was a lifeguard tower. It stood quite tall and had a flat roof. It was just right for a mouse to sit on and see from. Even better, from Belle's point of view, there was a little box, which held a mechanism for raising and lowering the tide flags. It sat on the roof in just the right place so she could sit out of the wind and still see. Belle made herself comfortable at once, putting on her Barbie sunglasses and arranging her wings like a blanket. Marie, Lil Mike and Buddy carried their things to their favorite spot, once everything was arranged and Pal was settled on the blanket. His job would be to watch the stuff. He liked the warm sun. And the rumble of the ocean reminded him of his mother's purr. Things were going along so well Belle had just about fallen asleep when the tip of her tail itched. (Awe you remember.) This itch was not danger exactly but irritation was on its way. The bully gull took one look at the odd little mouse and had to check her out. He walked right up and poked his bill in her face. "Go away," she snapped poking his bill. "Huh," the gull responded, hopping back and then forward again. He tipped his head to one side. *You will need to forgive him. He was so very ignorant; why, he didn't even have a name and only the most primitive language. He had never seen talking, flying mice before and he was just plain confused. He didn't know what Belle was but he did know she was sitting in his favorite spot. If she were another gull he would flap his wings and poke it with his bill and make it go away. So he tried flapping and poking. "Snap!" Belle zapped him gently with her middle claw. It sent up a tiny spark. "Caw!" squealed the gull jumping up in the air. He was not used to being ordered about and now he was irritated. So was Belle. She didn't want to hurt the foolish creature. But really. So he poked, and she zapped, back and forth. For quite a time they could be seen hopping, snapping, poking, cawing. It was really quite a scene as those two circled each other. At last Belle was standing on the little mechanism box with her hands on her hips, Wings full outstretched. "Look you, I am here on holiday and you are simply going to have to stand somewhere else!" She pushed her will into his simple little mind. "DO YOU UNDERSTAND?" The gull was quite ruffled and confused, but enough was enough. He had met his match and he flew off. "Finally!" said Belle as she arranged her self again with a bit of a huff. She checked things out below and began to relax. 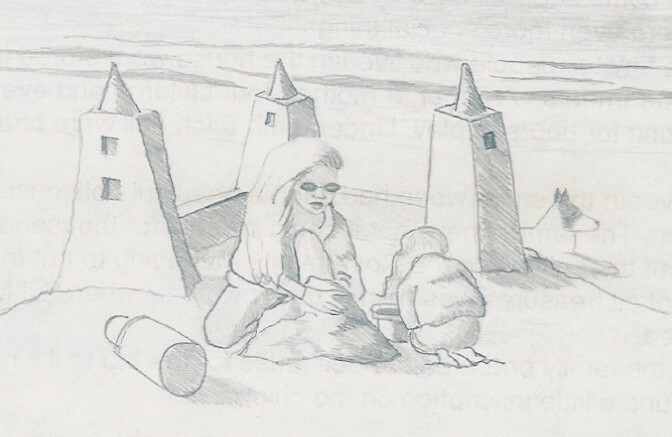 Marie and Lil Mike had pulled in the kite and were now very busy down by the water building their biggest and best sand castle ever. It really was a fine one, with four towers nearly as tall as Lil Mike herself with cone roofs and fine thick walls between them. They were even discussing a bridge and a moat. They didn't see the two men walking casually along the sand past their stuff. One of the men pretended to trip and stumble forward with his hand landing on Marie's purse. At that very second a huge orange paw set down on the man's hand with claws set out like little needles as a warning. The man let go of the purse. Pal pulled in his claws. The frightened man didn't need another warning. He was off in a dash. Pal chuckled and made himself comfortable. He gave a wink to Belle who was smoothing her tail (for the second time) and went back to sleep. The group had lunch and got taffy. They found rocks and fed seagulls (which irritated Belle a bit after her morning). Then Marie and Lil Mike went for a last walk in the water before heading home. Buddy was tired from the day so he found himself a place to lie down on a hill where he could keep an eye on them. Far down the beach a man and his oversized Labrador puppy were playing catch on the beach. The Labrador was really far too big, far too clumsy and far too dumb. When he saw Lil Mike squealing and laughing in the water he decided to join in the play. Dumb Dog came bounding down the beach right at Lil Mike. Marie was too far away to help and right in Belle's line of fire. Suddenly Buddy appeared like a flash of lightning. Just as Dumb Dog jumped up to knock Lil Mike down he was hit from the side, rolled four times and knocked silly. When Dumb Dog finally looked up, there was Buddy, bared, bristled, and braced (this is not good if you the underdog). The man who owned Dumb Dog ran up nearly out of breath. He bent down to Lil Mike. "Are you OK?" he asked. "U-huh," she nodded a little startled. "Wow! That is quite a dog you have there. He really takes care of you." The man shook his head. "That's Buddy, he always takes care of me. That's his job," said Lil Mike matter-of-factly. Buddy, finished with the pup, came over when he heard his name. "Holy cow," the man spoke with new amazement. "And who is this?" He pointed to Pal who had just gotten there. "Pal," said Lil Mike. "He takes care of me too." "I have got to have a picture of this. No one is ever going to believe me," said the man. He looked at Marie. "May I take one?" "Oh sure," she said. Marie got down and put one arm around Buddy and the other around Lil Mike. Pal put his front paws on Marie's leg and stood up tall.